Join us on First Friday for our latest show, Impermanence, a collection of memories and moments in the lives of two latino -American artists, Alexis Manuel Grajeda and Juan Jose Oliveros Saldana, based in Phoenix, Arizona. Impermanence explores the fleeting moment in the everyday, from mundane to paramount, capturing interactions with those around them. What, at first glance, feels insignificant and small, with continued inspection, soon becomes a precious snippet into someone's most personal moments. Step into these moments on April 5th, from 7-10pm at New City Studio. First Friday March 2019- Live. Loved. Dair Deckert’s paintings celebrate the incredible beauty God created for us to enjoy with all our sense. Dair’s colorful impressionistic worlds invite the viewer to linger while they appreciate this gift. through her work, she feels to inspire living life to the fullest while being aware of being loved. Join us for First Friday on March 1st, from 7-10pm and third Friday, on March 15th, form 6-9pm to experience this captivating and personal show. Come through for art Detour on March 16th, form 11:00am-6pm, and March 17th, from 1-6pm for your chance to connect with the artist. stick around on March 16th for a Slow art Meditation at 4pm. With so much to see and experience, this is truly a show for everyone and one you do not want to miss! Join us at New City Studio for a new and vibrant show all about capturing the very moments that move past us in the blink of an eye. From vibrant watercolors to contemporary dance by CONDOR/ dance company, each artist explores the Kinesis of moments captured and the essence left in its wake. This is sure to be a show you do not want to miss! Join us on February 1st for First Friday and February 15th for Third Friday. Hope to see you there. Join us on January 4th as we journey through the divide what we know and what we imagine. Jill jai miller is an Arizona based artist working in photography, mixed media, and artist books. Exploring themes of motherhood, family, relationships and memory, Ties that bind is a rich and poignant show featuring pieces spanning more than a decade of work that seeks to activate the audiences memories though the senses. Through smell, sound and sight, Miller seeks to show the audience that memories connect us to where and who we were decades before and influences who we are today. Join us on First Friday, December 7th from 7-10 as we take a unique journey through time. Family can look different from person to person. As we grow up, our definition and perspective of family begins to change and we create this category of those who become like family. On November 2nd from 7-10pm joins us at New City Studio for this warming and familial show. Through the lens of a camera to the stroke of a brush, nine artists explore their versions of what family looks like. Be sure to come out on First Friday. We would love to see you! Join us October 5th for an interactive art show with local artists, Charlotte Moore and Genise McGregor as they use block prints to explore the secret heroes who inspire change in ourselves. Using her recent humanitarian trip to Columbia as inspiration, Charlotte reflects on the inner beauty and heroic strength of the Columbian people as well as some wonderful Phoenicians. Influenced by the retablo tradition of her New Mexican heritage, Genise draws us into a detailed world of imaginative characters with touching and sometimes light hearted stories. Be sure to come out for the opening reception between 7-10pm on October 5th and be a part of the exhibition by contributing through hands on interactive/ collaborative works. Wherever we are in our days, in our lives there is always a sound to be heard. We absorb and we ignore, but what about the Echoes? On September 7th from 7-10pm New City Studio kicks off its new season with a stunning group show digging into vibrations that bounce through brushes, pencils, ink, and more. This moody, and beautiful show features 10 different local artists all exploring sound through sight. Be sure to tune in on First Friday, we would love to have you hear! Tidal is a two-person exhibition opening May 4th from 7 to 10 pm which ebbs and flows like the sea, causing shifts in energy and movement while reflecting dynamic transformations. Taber explores the global rise in sea levels, and studies threatened coral reefs. Through painting, sculpture, and printmaking her work captures abstract qualities of oceanic organisms while highlighting the beauty, power, and fragility of seascapes. Galofre draws inspiration from her upbringing in Andean habitats, her adventures in the American West, and her defining visit to the Portuguese Azores Islands. Her massive paintings envelope the viewer, encourage environmental empathy and ratify new definitions for the role of landscape within contemporary art. The powerful pair exhibit some work as wild the waves in the Pacific, others are introspective, subtle, and still like the Atlantic. Join us May 4th for the opening night of Tidal and again on May 18th for the final show before our summer break! 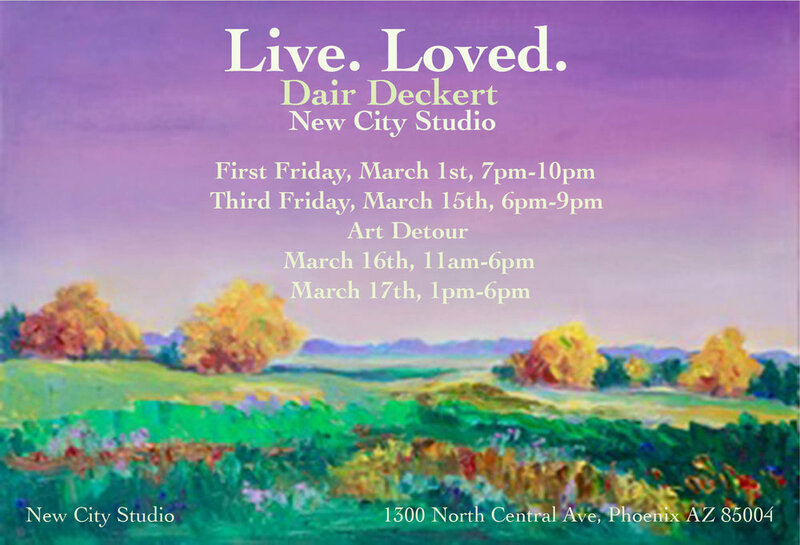 On April 6th from 7-10 pm New City Studio will showcase: “Phoenix Phabulous”, a collection of history murals from the early Hohokam civilization to the imagined future in Phoenix. This stunning mural series includes 16 large paintings created by local artists and exhibits the artist’s interpretations of the ages in Arizona with a focus on capturing the urban roots of our city. Phoenix Phabulous will have openings on First Friday from 7-10pm, and Third Friday from 6-9pm; see you there! It’s spring again in phoenix, which means things are thriving! From our flourishing art scene to cactus flowers and citrus surroundings; March’s exhibition at New City Studio has grown into a great one! The new show includes drawings, paintings, and photographs exploring ways to Bloom as seen in nature though the eyes of artists inside our community. With openings on March 2nd from 7-10pm and again on March 16th from 6-9pm, Bloom will be a show to see! Para La Famila is an exhibition exploring roots, family ties, and street sub-cultures from Phoenix. The show goes deep into the stories of eight local artists including street artists, photographers, and painters: Kevin Dmoe Aviles, Joshua Casteneda, Tony Salazar, Angel Martinez, Eduardo Urbina, Dillon Ekback, Isaac Torres, and Sentrock. Making connections between roots & their own stories, these eight artists show how family has influenced the ways they make art, and create culture. This exciting exhibition shows us through painting and photography how we can find and be reminded of family through the things we make. Culture pulls from all walks of life to create something bigger; pushing us to come together in art, creativity, and friendship Para la Familia. What happens when you pair 18 artists with 18 authors and give them six months to make collaborative work? In Sight II will also be presented as a limited-edition set of 18 chapbooks available for purchase online and at all events. Ever wonder what it takes to make a mural? Witness locals Laura Spalding-Best, Isaac Caruso, Jessica Palomo, and Clyde cover walls real time with live music, fresh brewed coffee, food, and wildly different processes. BIG works welcomes the community to enjoy this night filled with creativity, and to see exactly what “going big” looks like! The finished murals will be exhibited after completion with an exhibition opening on December 15th from 6-10pm. What comes together on canvas at night may perhaps surprise you. The sunlight fades away, our eyes begin to adjust, then Cam Decaussin and Spencer Simmons get to work. This Brand new exhibition Street Lights explores the lights that go on in Decaussin, and Simmons when they walk the low lit city. Showcasing a carefully selected collection of moody nighttime paintings Simmons Shares, “The serene feeling of painting at night amongst the lost and found shapes created by artificial and natural light has always felt right.” Decaussin adds, “When it is quiet, the mind begins to wander. The stillness of the dark, the removal of distractions, opens all things suppressed during the day.” Opening Friday November 3rd from 7-9pm @ 1300 N Central ave PHX, “Street Lights” is an exhibition you won’t want to miss! Making sense of what’s around us, what’s of us, and in us. Senses is an exhibition and exploration into the space between person and perception. Join us October 6th as we open our second show of the season from 7-10pm on First Friday and 6-9pm on Third Friday. Featuring live music, and a handful of local talent Senses will be filled with sights sounds and more you won’t want to miss. September 1st marks opening night of the much anticipated show "Eyes on Us" featuring more-than-portrait-painters: Larry Madrigal, and Tyler Griese. Madrigal uses paint to convey his internal world; thinking, and speaking through the eyes of different people. His portraits are both clear, and personal tending to look at the viewer with a confrontational gaze. Griese uses painting to capture the stories and struggles of people. He elevates human narratives in order to develop a more empathetic view towards a myriad of different contexts of what it means to be a person. In this dazzling exhibition both artists look deeply within themselves and into others; drawing/painting people past the surface, memorializing peers and promoting empathy. May 19th New City Studio features the work of Lagomm: a collaborative studio space in Tempe seeking to spread art, creativity, and opportunities to artists and art-advocates. The brand new exhibition, “It’s a Process” features the work of five Lagomm artists with wildly different practices, all working towards the common goal of pursuing their passions. The exhibition investigates lives built in creativity, the work ethic, the patience, the passion, and the process. Engage with new works and interesting installations by Brett Eichmann, Chelsea Lyles, Briana Voron, Miguel Cardona, and Nick Rascona addressing the work behind the work and the tools which move us forward. Join us on may 5th @ 1300 n central ave phx where we pass the mic. to some of our cities most valuable voices. Witness the works and wonders of youth in our city featuring sculptures, drawings, paintings, and poetry put together by students and staff from two incredible organizations. May 5th from 6 to 9 pm in partnership with Free Arts for Abused Children, and The Rag Collection New City Studio puts an amp to some young artists in the making and invites you to come let their voices fill the senses. What’s up World is an exhibition which investigates the world we all share. In this group show local artists invite viewers to step outside of their own experiences, and to think about the bigger picture. It is often easy to get wrapped up in our own lives but the need to broaden our scopes is always pressing. Come say what’s up on April 7th between 7 and 10pm or 21st for Third Friday from 6-9pm . See you then! We’re all a little odd in fact if you are completely normal, that’s a little weird... March 3rd at New City Studio we present a huge group exhibition which will activate your sense of wonder, and open your eyes to uniqueness. Come see drawings, paintings, graphic designs, and sculptures from artists all over the valley celebrating the individuality, and diversity our city has to offer. From 7-10pm on First Friday, and from 6-9pm on Third Friday; come check it out, don’t be a stranger. @ 1300 North Central Avenue Phoenix. Walk in to the New Year, the new work, and New City Studio on January 6th. Enter Binary Passage from 7-10pm; a transformative exhibition, with sculptural works coming off the wall, and out from the ceiling! Full-time artist Christine Cassano and artist/ ASU professor Rossitza Todorova zoom-in to ideas of time, origin, and memory. Both artists have exhibited work locally, regionally, and internationally. Cassano is a recent recipient of several prestigious grants both from the Phoenix Institute of Contemporary Art and from the Phoenix Art Museum; she uses elements of the biological, and the technological to speak about a future imperfect. Featured in permanent collections at ASU Art Museum, U of A Art museum, Tucson Museum of Art, the Painting and Sculpture Museum in Istanbul, and more Todorova explores combinations of urban decay and natural transformation. Together the pair have created a stunning body of work which will have openings on First, and Third Friday next month as well as an artist talk on Saturday January 14th from 12-2pm. Once a year, New City Studio takes a minor detour from our typical art gallery operations to help those in need, both locally and globally. We do this through an event called Shopping with Purpose where we host vendors from around the valley whose proceeds go to a variety of charitable causes. We are excited to host this event once again, and are expecting it be the best one yet! Join us December 2nd for our 6th annual Shopping with Purpose event! We are thrilled to be hosting a wide variety of vendors, from jewelry to home decor and everywhere in between for the event this year. Since we're all spending money on gifts during this season, why not spend it with organizations that help others? We are expecting a large turnout this year, so get there early and don’t miss out on supporting local and global causes. Featuring local artists Bradley Thompson, and John Tuomisto-Bell. Veterans John Tuomisto-Bell, and Bradley Thompson come together to exhibit stunning works that demonstrate the hardships, troubles, and turmoil affiliated with war, and violence. Tough Times sheds light on a darker side of humanity, and allows the viewer to peer through the lenses of artists/vets Thompson, and Tuomisto-Bell. Thompson deconstructs military culture with paint and reconstructs narratives dealing with war, poverty, and mental health while Tuomisto-Bell exhibits cast-bronze sculptures exploring the effects of violence, and aggression. Featuring local artists Zach Valent, and Joshua Gutierrez. Passing Papers is a show about the past, memory, and the way things fade but tend not to disappear. Exploring the malleability of memory, Josh Gutierrez exhibits chemically altered photographs and handwritten letters of those who have experienced loss, but still hold on to memories. Zach Valent exhibits cast concrete sculptures of modern day objects deteriorating, and fading with the aesthetic of geological aging, and a focus on the rapid advance and footprints of modern civilizations. Together these two local artists explore the passage of time, ideas of preserving memory, and question what it’s like to deal with change. Featuring local artists Chris Vena, and Ariana Enriquez. Chris is a traveler, he has exhibited internationally, and he’s lived in other parts of the world. Inspired by a violent police crackdown on peaceful protests in Istanbul, (Chris’s home at the time) his work investigates the idea of resistance in political climates and its importance. Chris seeks to document political unrest through painting, and to explore the nature of things in our country, and around the world. Paying homage to family and organic complexities found in nature, AZ based artist Ariana Enriquez explores the parallels between people, plants, flowers, and insects. Inspired by the idea of, “growing without permission” Ariana delves into to the fragile, yet powerful nature of things. Our first ever all-sculpture group show. This unique group of local artists has helped shape the arts scene of Phoenix. You won't want to miss seeing their newest endeavors. Lines, layers and textures invade smooth facades, exchanging surface beauty for depth, character, strength and wisdom. My paintings are inspired by objects ravaged by nature and the participating elements, including; water, wind, earth or fire. To me, the longer something stands the tests of time, the more interesting it becomes. I am drawn to the details of the imperfect, needing to tell its story: A tree on fire – literally or figuratively; a perspective magnified or obscured by rain; a piece of wood that’s been weathered; eroded rocks, and metal rusted and etched. Our annual 'Shopping with Purpose' event is back! We're excited to host several local vendors whose proceeds all benefit various charitable causes, both local and international. Since we're all spending money on gifts during this season, why not spend it with organizations that help others? Join us on December 4th from 6-9pm for a great event...wine and music as always!